Newbury Racecourse offers fantastic deals for group bookings and some great value packages, perfect for an all-inclusive day at the races. With top-quality facilities in a beautiful setting, Newbury Racecourse offers enthralling action throughout the year at over 29 racedays. Racing highlights include May’s Al Shaqab Lockinge Stakes and the Ladbrokes Winter Carnival or for an all-round summer day’s entertainment, Newbury regularly hosts world-famous artists on our famous Party in the Paddock racedays. 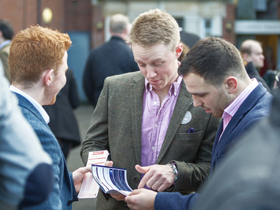 With ample free parking for coaches and our own main line train station, Newbury Racecourse is a convenient and welcoming venue for a group day out. Free Grandstand entry for coach drivers. * Tickets must be booked at least 7 full days in advance, valid for ticket purchases only, excludes Party in the Paddock live music. 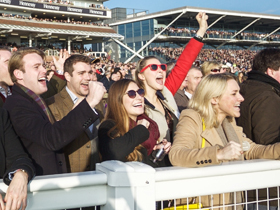 To claim your group discount choose the raceday you require, click ‘Buy Tickets’ then insert the number of tickets required next to either ‘Premier’ or ‘Grandstand’. The discount will be applied automatically to your order before you pay.